Supercharger - Nutritional Dairy Fat Supplement - ORIGO - Supplier of High-quality animal fats and vegetalbe oils. Supercharger is a rumen bypass fat designed to be an economical choice when liquid tallow is not available or ease of handling is an issue. 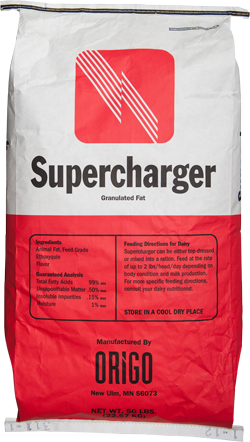 Featuring a partially hydrogenated animal fat base, supercharger is approximately 2.25% more energy dense than grain products. This was our first product introduced into the marketplace and is still one of our leading brands. Supercharger is an extremely palatable rumen bypass energy fat. The addition of molasses flavoring allows for even top dress situations. Supercharger offers an excellent alternative to liquid fats. As a rumen bypass fat, higher levels of energy can be obtained than with a liquid fat without affecting rumen function. Supercharger packages in easy to open bags or totes which eliminate the handling issues associated with liquid fats. Supercharger mixes easily into a feed ration and will not clump or stick to mixer. Supercharger carries a 99% fat content compared to some rumen bypass fats which are as low as 83% fat. With such a high fat content, there is more energy in this fat compared to all that inexpensive filler.